Q: It appears that you and Coach Osborne were quite often of the same mind on a great number of things. Was there anything else you ever brought to him, anything interesting that we could share? JS: Well, there was one time that I recall an idea having quite a profound impact. I believe it was the 1994 season and I went to Tom this one day and said, ‘Coach, I would like to have a few minutes to talk with the team –the whole team- in the team meeting today.’ And Tom took a little step back and gave me an astonished look and said, “The whole team? There must be something extremely important for you to want to do that…” And I told him that I felt it was something that needed to be shared with everyone and that they would all benefit greatly. Q: The “9th Week Syndrome”? JS: The 9th week. The season is a grind and kids can lose focus. And it really made me feel good when, at the meeting’s end, Coach Osborne reiterated everything I’d shared and said, “Guys, Doctor Stark is right,” -I think even he was surprised that I’d come up with that- “..you take care of yourselves and be sure to get all your rest like he says and prepare for your exams.” It really validated some of the things that I’d been thinking about and prevented a slip-up going forward. I really believe that. Q: That’s magnificent insight! And Jack, can you tell me a little about the pre-game speeches by coaches, do you have any opinion of those? JS: Charlie McBride used to do one on Friday night and they’d be so jacked up they couldn’t sleep. (laughs) So we changed that, started going to a format on game day where Charlie would talk to the defensive players and the offensive coaches would speak to the offense, and after they’d be done talking we’d watch a video psych-up tape I put together that week. And after the psych-up tapes we’d have the captains talk, and then right before they ran out to the field they’d say that prayer. Q: Do you still have copies of the psych-up tapes? JS: I might have some in the basement. I’m not even sure. They’re pretty scattered. They were mostly highlights from the previous game set to music. Q: Anything ever backfire on you? JS: One time on tape one of the guys predicted we’d beat Kansas by 40 points, and some of the coaches thought that wasn’t a good thing to put in there. And 99% of the time they were right. Q: Do you recall the score of that game? Did we win by 40? Q: Any highlights that stand out to you from a particular game or moment? JS: I think… to me it was Osborne’s winning the bowl game after the ’94 season: we ended up alone in the elevator and he was thanking me for all I’d done, and to me that was pretty special. Those ’94 and ’95 bowl games, there were so many people at the airport; it was single file coming off the plane. That was kind of nice, too. Q: What are you most proud of, Jack? JS: Well, I’ve never said it in public, but the thing I’m most proud of was that nobody in my 14 years had ever once attempted suicide. Never attempted it or did it. Given the stress and pressure of 150 players a year for 14 years, that’s a lot of players. I went to great lengths to make sure nobody felt like that was the option. We usually stayed on top of it, and if it ever became an issue we were there to stop it soon enough. Q: If I recall, a player had committed suicide prior to the 1983 or 1984 season. JS: You know, I think there was sometime around there. I’m not sure of the year. Q: Can you give me an idea of the pressures these young men were going through? JS: Well, the biggest pressure, too, is that some of these kids come from homes that have nothing. And they know if they can make it through and get drafted and have a shot at it, it’s just huge. Financially, identity-wise, the dedication of everything they’ve done since they were 6-7 years of age, if they don’t make it? It’s just crushing to them. So I always tried to have them make sure to have a dream, a backup plan. If they played pro ball, great, but if it didn’t happen they could always go on to something else. Q: Did the players read the papers much? It’s easy to say that they don’t, but are they affected much by what they read? JS: Well, they read the internet and blogs and everything else. And you try not to let it, but it impacts them. Some of those people are crazy, it’s crazy what you see online these days. Q: What advice would you give those fans? Any positive, constructive advice from the Doctor? JS: Well, I’d just remind them to remember what it’s like to be 18, 19, or 20 years old. You know, if you’re forty that’s one thing, but if you’re a young man and you’re trying and you make mistakes, some people say an awful lot of things that create a lot of stress, a lot of hurt. 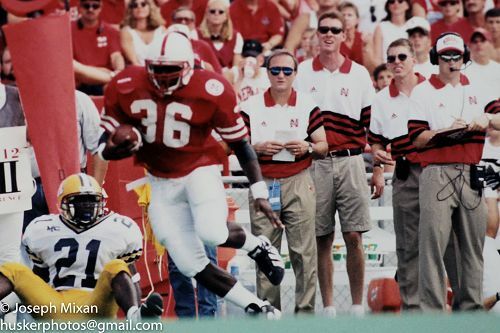 Q: Speaking of, so many guys talk about Lawrence Phillips. How would you sum up your experience with him? JS: Probably one of the most talented players, and such a tragedy for all that talent to go to waste. He should have been the #1 draft pick, but wound up the 8th, 9th, 10th, somewhere. He just wasted it all, it was incredible. Q: Do you keep in touch with him at all? JS: I hear he’s in isolation. And I hear he has quite a few more years to go. Q: If you could do the whole thing over, Doc, what would you do differently? JS: Probably not a lot. I’d probably try to take care of my health a little better. Because it ended up with the surgery and a couple of issues, so I wish that could have worked out better. Q: What drove you, what inspired you to play such a heavy part in this thing called Nebraska Football? JS: Well, I had a very active private practice and I was pretty intense, and I decided I wanted to do something for some young people and I thought it was the thing to do. And once you get in there, there are so many needs that you can’t say no, so you find yourself being there 10 hours a day, easily. And I’d find myself working an extra 15 hours a week there for free, (laughs) because kids responded and appreciated it and need it. And what we did with Danny Nee and the basketball team was unprecedented, too, going to the NCAA Tournament all those years in a row. We had some good teams. Q: If you were to shine a spotlight on somebody in the background who played a large role, do any names stand out? JS: I think someone who never got full credit, who left before all this really paid off, it was Dr. Ursula Walsh, an ex-nun who got a PhD and became the first director of the academic program, and she was like a Tom to those kids. She ended up doing more counseling for those kids and I kind of saw myself trying to pick up where she left off. But all the academic stuff, that was so solid. She deserves some credit for that. She is the one who, through academics, helped a lot of kids out with the structure she set up. And strength coach Bryan Bailey, I forgot about him. Those guys just loved Bryan Bailey. JS: Because Bryan was a very caring guy. He made no money, hardly, but he could relate to the players and did a lot of individual stuff with them, and he helped them. And a lot of them didn’t like Boyd. They hated Boyd, they just didn’t like the guy. There were a couple of them, the bigger guys, would probably like to have beat him up. (laughs) He wouldn’t come down to the floor very often and spend much time with them, so they didn’t get along with Boyd too well. But Bryan was always there for them. The thing about those players: you can’t fool those guys. You can’t BS them and you can’t fool them. They see what’s going on and who’s doing what and they know. It was pretty unanimous, the word got around that they didn’t like a coach or staff member, it was pretty black and white. If they liked you -like Bryan Bailey- they really liked you. I think he did an awful good job for them. And Keith Zimmer in Academics/Life Skills, I saw him do an awful lot of good for those guys, too. Q: Is there anything we haven’t touched upon that differentiated those teams from others of their era? That set them apart? JS: Obviously, you’ll never have another Tom Osborne, not in your lifetime. His skills, leadership, talents, how he did things, I think he’s gotta be one of the top three or four coaches in all sports for all time. Your John Woodens, you know? What he did in 25 years was unapproachable. I don’t care who you are or what sport you coached, good year or bad year, you‘d have injuries, you’d have something, and to do what he did is beyond the norm. It will never happen again. Q: From one Doctorate in Psychology to another, what made him tick? Any insights the average person wouldn’t know about? JS: I think his grandfather was very special to him. I think it was his spirituality and character that separates him. Let me ask you, Paul, did you ever see him disrespect anybody, put anybody down, swear at anybody? Never. I can’t even drive to Omaha without getting road rage and cursing at someone. (laughs) But he’s the most unique man I ever met in my life, and if you don’t have Tom Osborne you don’t win. You just don’t. Trust, proficiency and open communication are essential to any successful endeavor, and just about any business management textbook will tell you the same. With as large a roster as Nebraska had at the time (160-180 kids) Dr. Jack Stark had his work cut out for him. And with an ultimatum and a timetable set by Coach Osborne, he appeared to be a short-timer and a dreamer, having champagne tastes on only a beer budget. But with a forward lean, a strong shoulder, an open ear, and many trips up and down I-80, he eventually ingratiated himself into the team’s inner sanctuaries: their hearts and minds. This Eminence Outlier made it all come together, and I fear my words cannot do the man and his work justice. Much has been made of the Unity Council (and there will be more), but I just now learned that it was co-birthed as defensive lineman Kevin Raemakers’ brainchild during this conversation. The famed Unity Council appeared on campus shortly following the appearance of its namesake term: Unity. I recall every Memorial Stadium office door and hallway wall early in the winter of 1991, where just about everywhere you turned there was a Scotch-taped, horizontal 8 ½ by 11 sheet of paper with one, simple word etched in block letters: UNITY. While the barriers were being brought down by an ‘intermediary’ in Jack Stark, if you will, between the players themselves and between the players and coaches and support staff, a subliminal message was being whispered in all directions: “We are one. We will prevail as one. We hold the key to success if we function as one.” Perpetuating the collective ‘We’, there was also the sentiment that, “We will make it to the top and, in the process, be forever known as the team of legend to give Coach Osborne his first national title.” It was a dream of every season’s team to be the one to do so. UNITY, UNITY, UNITY. It was on t-shirts, too. Everybody got one. The next year there arose more t-shirts and signs plastered about with a newer, expanded version: Unity, Belief, Respect. From these basic building blocks grew greater team harmony and trusting, an approach to understanding and appreciating each individual no matter the environment one came from, and a positive mindset that the resultant bonding would produce outstanding results on the field of play. Particularly telling, too, was Dr. Stark’s method of identifying and upping the ante for future team leaders, setting the stage for positive peer pressure. Funny, but when a person typically hears the term ‘peer pressure’ it is usually in a negative connotation and speaks of keeping a child away from unsavory friends and their influences, choices, and poor leadership examples. Equally telling was the varied mix of leadership styles, from the punch-you-in-the-head types to the watch-what-I-do-and-not-what-I-say types. Theirs was a very interesting, multi-faceted mix. If it wasn’t apparent, you can see that Dr. Jack Stark poured his heart and soul into that team of young men as well as the coaches. For the coaching staff, there was the way he alleviated generational communication gaps and ‘tuned the coaches in’ to their student’s psyches, alerting them to times of vulnerability and the need for a hug some days rather than a swift kick in the rear. For some of these players there was a crucial support system and a father/brother figure whom you could confide in and trust implicitly, oftentimes helping to bear the stress of the unique, pressure-cooker lifestyle of a high profile student/athlete. I find the manner in which Jack left Nebraska Football both curiously amusing and yet tragic, for his heart was literally broken in the way the Frank Solich firing transpired. It takes a man of character to properly esteem another’s character, and for Jack it was the end of the road soon thereafter, his unwillingness to remain among lesser leadership coming to bear. Jack’s leaving the campus was a Nebraska Football loss that does not appear in any of the record books. For history’s sake it should, because it signaled the beginning of a fall from football grace.